... 1935, Emmy Noether (left) died in Bryn Mawr, Pennsylvania, following complications from surgery to remove an ovarian cyst. Her passing occurred 53 years after her birth in Erlangen, Germany, site of the university where her father lectured in mathematics and where she, in 1907, earned her Ph.D. in the same field. (credit for photo believed to have been made in this period) Jobs for women were scarce; she worked for several years without pay and then for additional years lecturing under a man's name. Finally, in 1919, she was appointed a Privatdozent at the University of Göttingen. 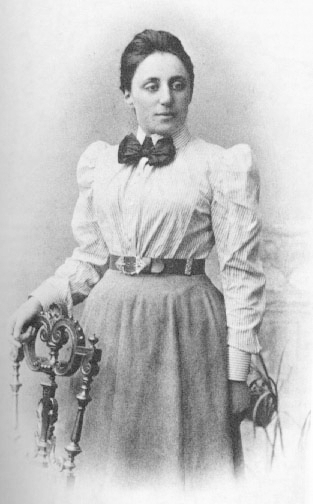 Noether taught there, earning a reputation as a groundbreaking theorist, until Nazi exclusions of Jews forced her to leave Germany; she joined the faculty at Bryn Mawr in 1933. A recent New York Times profile, entitled "The Mighty Mathematician You’ve Never Heard Of," wrote that Noether's theorem, which "united with magisterial concision two conceptual pillars of physics: symmetry in nature and the universal laws of conservation" is considered by some to be "as important as Einstein’s theory of relativity." Nevertheless, "Noether herself remains utterly unknown, not only to the general public, but to many members of the scientific community as well."